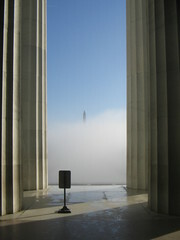 This photo I took of a fog-shrouded Washington Monument, seen from Lincoln Memorial, has recently gotten a little more attention by being cited in DCist’s “Weekly Feed: Little Cat Feed Edition.” The photo is part of the Foggy DC photoset, the visual fruit of an unusually warm, moist Washington morning just over a year ago. As you can see from the archives for that month, I wasn’t posting much at the time, engrossed as I was in getting Jopogo off the ground and seeing to a mile-long list of online and offline chores (many items of which list remain to this day, but here I am, posting more frequently than before, go figure), so I couldn’t really give the fog photos as much attention as I would have liked beyond a cursory pair of thumbs. 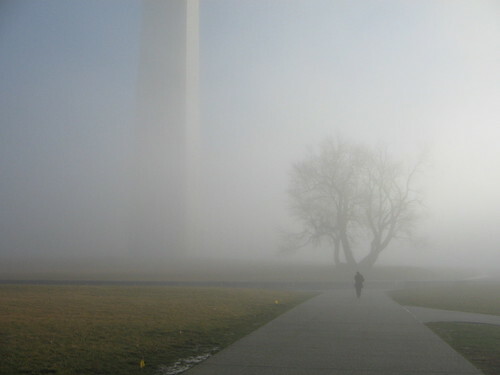 The DCist mention has reminded me of it, however, so I would invite you to peruse Foggy DC, about a year late, but still worth checking out, if I do say so myself.